Here’s the news about sad, needless loss of life in the ongoing dispute between the Peruvian government in Lima and the indigenous people in the Peruvian Amazon, who are trying to protect their lands from development. In English from AP and in Spanish from El Comercio. Another needless tragedy in a country that has fantastic human and natural resources. There’s no justification for violence, and blame on both sides. Check out IKN for more insight on the developments leading up to this. If the global events of the last year or so prove anything, it’s to be leary of rich old guys in suits. The money-at-all costs Peruvian government of Alan Garcia and APRA need to realize money is just a funny printed paper, making money in Lima is fruitless if it doesn’t improve the lives of all Peruvians. 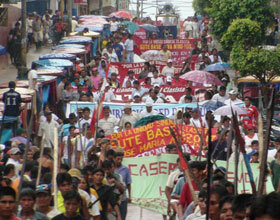 There are now 7 police and 22 indigenous civilians reported killed in the unrest in Bagua, in the Peruvian Amazon. Pictures and reports of reporters possibly also killed at La Republica. As they say in Belgium “Trop is Te Veel, and Te Veel is Trop”. Time for Alan Garcia to resign. 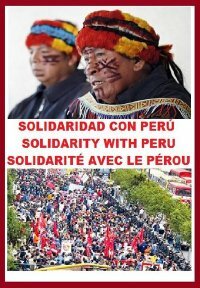 This entry was tagged Alan Garcia, amazon protest, Amazonas, Bagua, dead, indigenous people, Peru, police. Bookmark the permalink. Here’s the Duke University study that estimates 72% of the Peruvian Amazon has been zoned for exploration and development. Thanks 4 your comment at Global Voices Online. A Sad day, really.